Muay Boran means ‘ancient boxing’ and refers to the various styles of Thai martial arts that existed up to the early 20th Century. Each area of Thailand has its particular style of Muay Boran. For example, Southern Thailand has Muay Chaiya and Krabi Krabong (weapons-based martial art). Similarly, Central Thailand has Muay Lopburi. Eastern Thailand has Muay Korat which can trace its origins to the Angkor Wat area in Cambodia. And finally, Uttaradit province, in the Northern Thailand, has Muay Tha Sao. Nak Muay means fighter in Thai. The most famous ancient fighter was Nai Khanomtom. Legend has it that in 1774, while a prisoner in Burma, he fought 10 Burmese fighters, one after the other, and beat them all. The Burmese King was very impressed. For this reason he freed Nai Khanomtom and allowed him to return to his home in Thailand. He quickly became famous and his new fighting style spread like wildfire all across Thailand. Subsequently, in the early 20th century, Thais introduced rules to modernize Muay Boran. People built gyms with boxing rings and training equipment to practice this martial art. Although these ancient techniques persist to this day, they are simplified to be most effective in fights. In time ancient boxing morphed into the current Muay Thai sport that we see today in boxing stadiums in Thailand and around the world. Boxers who practice Muay Boran do not use gloves. They use ropes around their fists and arms. These Muay Boran style ropes are known as kard chuek in Thai. Few people know how to tie them correctly. Muay Boran practinioners also use arm amulets and the famous Mongkol or head amulet, for luck and to show respect to their teachers. Soleh and Padu wearing the Muay Boran style wraps. Where can I learn this ancient martial art? Unfortunately there are few gyms in Thailand that offer courses in the ancient styles of Muay Thai. Mostly because fewer people learn and pass it on to the younger generations. 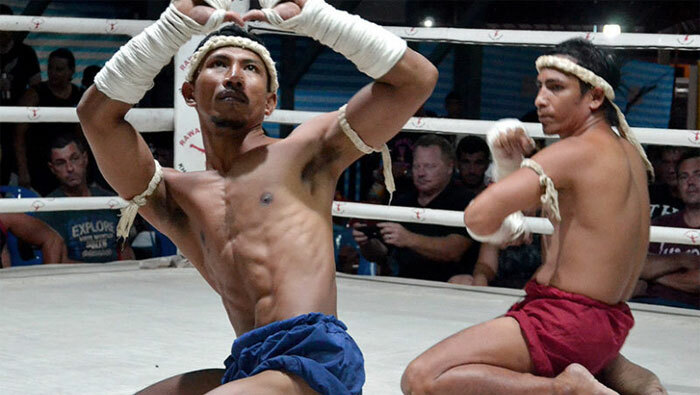 With the success of Thai Boxing around the world, the old styles have lost in popularity. The emphasis nowadays is on fighting. Gyms teach techniques that are fast and direct. The old styles are not used in current competition. Unfortunately few teachers are left who can pass on this ancient martial art. Luckily Rawai Muay Thai is one of only a few gyms in Thailand that offers Muay Boran classes. Our trainers Tuk, Chanchai, Soleh and Padu are certified in this ancient style. You can take private lessons with them to learn some aspects of this beautiful martial art. You can book classes in the gym office. Each private lesson costs 700 baht. The course is 10 hours long and costs 10,000 Baht. You have a test at the end, and if you pass, you get a signed certificate from the gym. Trainers Soleh and Padu show their Muay Boran skills. Namsaknoi and Buakaw show their Wai Kru.